The Turks and Caicos Islands generally try to do things the American way, with the notable exception being that we drive on the left - despite most of the cars on the road being American left-hand drives! Thus, in many aspects, Providenciales feels like a cleaner, less populated, lower density version of Miami. Indeed, one major difference many tourists will notice is a lack of ATMs in the country, and the fact that many smaller stores don't accept credit and debit cards. This doesn't seem due to any technological limitation, rather just a reluctance to pay the charges associated with accepting cards. The oficial language is English and its spoken by the vast majority of the population. Low-skilled workers may speak Haitian Creole (corrupt French) or Spanish (Dominican Republic), but these are not typically front-side service personnel. We use the United States Dollar. 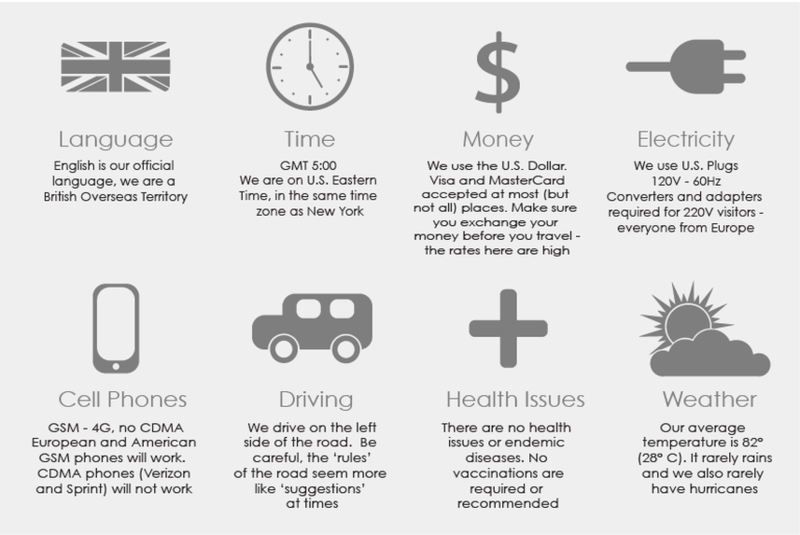 Visa and MasterCard are commonly accepted at most, but not all, hotels, shops and restaurants, so be sure to ask. If you are coming from a country that uses a currency other than the US dollar, be sure to exchange your currency before you arrive. The only way you can exchange currency here is through the local banks, and they charge exorbitant rates that will take a bite out of your vacation budget. In addition, queues can run into hours (no joke) for service. There are three major banks: Scotiabank, Royal Bank of Canada, and First Caribbean. First Caribbean offers Visa ABMs and Scotiabank is on the Cirrus network. If you require teller service, be prepared to wait as local banks often have huge lines, and you may easily wait over an hour for service. Western Union provides cash transfer services and there are several agents around Providenciales. The legal drinking age in the Turks and Caicos Islands is 18. Patrons appearing under 21 will be asked to show ID. Drugs are strictly prohibted, including marijuana. If it's illegal in the United States or the United Kingdom, it's probably illegal in the Turks and Caicos Islands. Firearms and other types of weapons are strictly controlled and possession requires a permit. There are mandatory minimum sentences for possession of firearms without a license. The crime rate in the Turks and Caicos Islands is low compared to the Caribbean, but is high compared to the United States and Western Europe. Read our article on Safety and Crime for more information. We use the US standard for electricity; 110 Volts, 60 Hz, US-style receptacles. If you're coming from a country outside of North America, or parts of South American and the Caribbean, you'll need a plug adapter. You should purchase this before you arrive, as they can be difficult to locate on the island. We drive on the left, similar to British and Commonwealth countries. Ironically, most cars come from the US and will have left-hand drive, as opposed to the proper right-hand drive. People 18 years and older, holding a valid driver's license, can rent a scooter. You must be 23 or older to rent a car or jeep. See Driving in the Turks and Caicos Islands. Until recently, all telecommunications on Providenciales was operated by LIME (formerly Cable & Wireless), which for over 100 years had a legal monopoly. There are now two other firms providing mobile service, the regional Digicel and the local IslandCom companies, and the cable company now provides cable internet service. Landlines - LIME is the only provider for landline telephones. Mobile - We use GSM 850/900/1800/1900. LIME uses the GSM 850 standard, whereas Digicel and IslandCom uses GSM 900/1800/1900. TDMA and CDMA phones are not supported. All GSM phones (i.e. those with SIM cards) should be able to connect to a local cellular network. Roaming ability will depend on whether the local companies have a roaming agreement with your service provider. Generally, you should be able to roam without problem, especially if your service provider is a major company. LIME provides broadband DSL up to 3 Mbps, and TCExpress provides broadband internet via cable. Internet at your Hotel / Villa - We do have free internet at Aqua View Villa. Most hotels on the island have some sort of internet connection, which may be just an old computer in the corner, or the owner's personal desktop in the office. If you will require internet service with a notebook, be sure to check that "internet service" means Wi-Fi wireless access and not use of the owner's computer. Internet Elsewhere - There are several internet cafes on Providenciales. For those staying in Grace Bay , visit the Deluxe Business Centre at the Saltmills Plaza. Near Turtle Cove is CompTCI, and on Leeward Highway is The Computer Guy. Radio and Television - There are several local FM radio stations. Spanish-language AM broadcasts from the Dominican Republic can also be found. The official government station, Radio Turks and Caicos, is found at 107.7 FM. In the unlikely event of a hurricane, this is the station to tune into for bulletins. WIV provides cable television service, and produces local news and shows on channel 4. PTV8 (People's Televsion, channel 8) provides an alternative news channel. GMT-5, Eastern Standard Time, same as New York. We're 3 hours ahead of San Francisco, 1 hour ahead of Chicago, 5 hours behind London, 6 hours behind Berlin, 8 hours behind Moscow, 14 hours behind Tokyo, and 15 hours behind Sydney. See also Turks and Caicos Weather. In a word, very hot and dry. Although the temperature is usually around 80° F (26° C), the intensity of the sun makes it seem much hotter. Be sure to drink plenty of water! Overall, it generally does not rain much and is usually very dry and dusty. However, there can be rain storms that last on and off over several days. These storms can dump several inches of water and flood low-lying areas. Check out our best times to visit Providenciales and our weather pages. See listings for Shipping, Courier and Postal Services. There is one branch of the Post Office located downtown that offers regular post services. There are no post boxes in the country. Post cards cost 80¢ and letters 60¢ to mail. Delivery can take several weeks, ranging from 2 weeks to 6 months. FedEx, DHL and IBC (International Bonded Couriers) provide courier services. UPS also provides limited incoming-only service. There is no delivery of postal mail, as people simply collect their mail at their local (island-based) post office. Addresses can be simply 'Name, Island, Turks and Caicos Islands'.